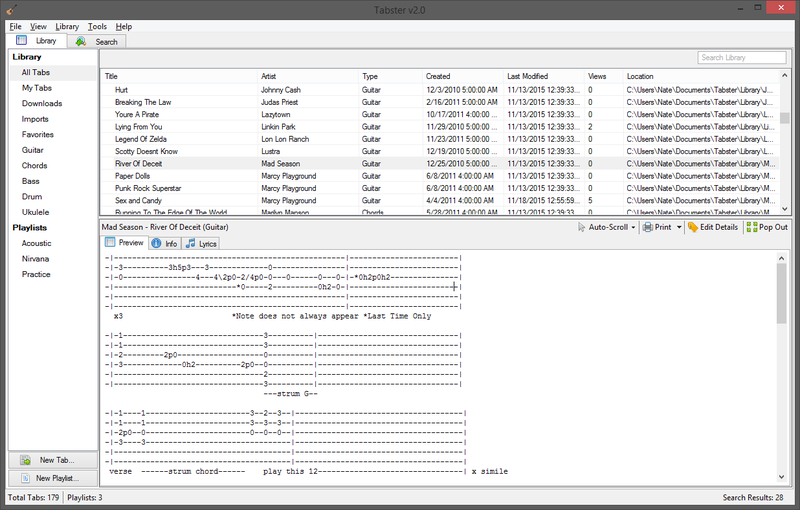 Tabster is a free, open-source application that allows you to easily create, organize, search, edit, view, and print ASCII tablature for guitar, bass, drums and more. Easily organize all of your tabs in one place, where you can search and edit them with ease. Create playlists to better organize your library. Seemlessly search for new tabs from popular tablature networks and add them to your library with a single click. Operating System Microsoft Windows 10, 8/8.1, 7, Vista or XP. 32/64 bit. Use the issue tracker to report any bugs..
Plugins are placed in the 'Plugins' directory, located in your installation directory. Subdirectories are fine, as long as they are nested within the 'Plugins' directory. Can I run Tabster on Mac/Linux? Currently, Tabster is not 100% Mono-compliant. This may change in the future however. How do I create plugins? Plugins can be created using any .NET language by referencing the appropriate assemblies. See the plugins section for more information. What sites/archives able to be searched? 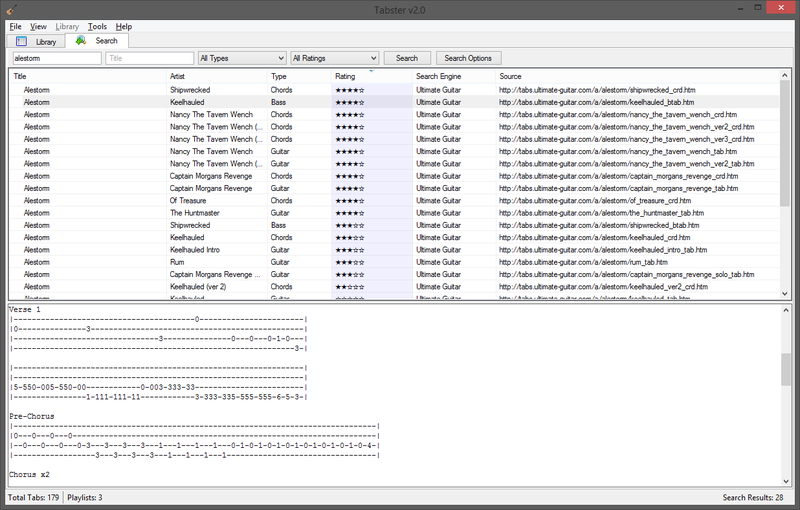 Natively, Ultimate Guitar, Guitartabs.cc, and Songsterr are supported with more to likely be added in the future. Plugins allow you to extend Tabsters functionality. Currently, plugins can offer alternative import and export formats as well as search providers. To install plugins, locate the plugin directory (%APPDATA%/Tabster/Plugins) and extract the appropriate .zip file into the directory. Restart Tabster if it is already running. For information on how to create plugins for Tabster, please refer to the Plugin Development documentation. Know how to program? Want to add new features to Tabster or have your plugin included in future releases of Tabster? Tabster is open-source, meaning you can easily contribute to the project on GitHub. Programming not your forte? If you like, you can still contribute to the project by donating. Tabster is a project I started years ago for my own use out of frustration of having to work with cluttered tablature text files. I eventually released it publically after enough interest was shown in the project and work on it during my free time and have since distributed it freely. Donations are not necessary but are certainly appreciated. © Nate Shoffner, 2016. All rights reserved.